If you’re thinking of revamping your personal space inside the house where you can enjoy yourself or hang around with your friends, you’re going to love this discussion on the basics to consider when setting up your man cave. Even though most man caves are themed using black, white, or charcoal grey, you don’t have to go down that same route if you think that those colors won’t reflect your style and personality. You can go for expressive colors like blue. You can play around with the different shades of blue. You can also consider other colors such as oranges, fiery reds, chocolate brown, eggplant, and other dramatic and bold shades. Fabrics can look and feel very manly. You can use items like tartans and plaid woolen blankets. You can consider using decorative pillows that are covered with thick corduroy or flannel. Old pinstripe suiting that can be found at thrift stores are a good choice as well. You just need to reinvent them a bit. Large sweeping curtains that have bold stripes or chevrons or other clean linear looks work great for your man cave as well. You can make your own throw pillow cover if you want to by using old shirts and rugged old jeans. You can also cover a wall using burlap to add interest while cutting down echo while still keeping a manly and rustic feel to the room. 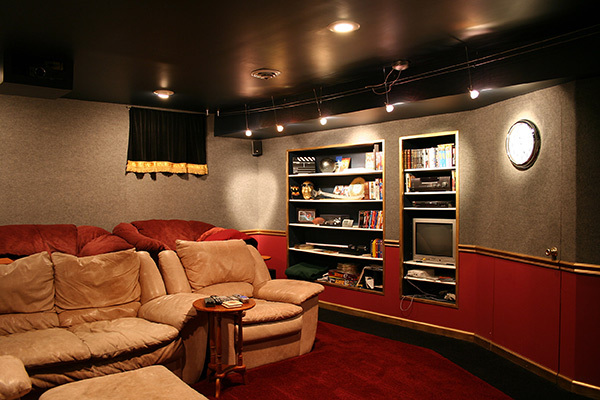 Sectional sofas and leather sofas have been a popular choice for man caves for a very long time. Depending on what you are looking for as the main purpose of the space, barstools, theatre-style seating, and comfortable recliners can add just the right flare and add a level of comfort and versatility. Leather is a popular material because of its biker feel. But, you can try to think outside the box and make up your own style. An indoor hammock and beanbag chairs can be a great alternative too. For your tables and lighting, you can consider wood, stone, metal, and glass or any natural material that features clean lines so that they won’t add up to a big and chunky look given off by your seating choices. When considering accents for your walls, you don’t have to stick with guitars or sports equipment. How about trying out a surf-style room where you have your coffee table made from an old surfboard mounted on legs and have a Tiki-style mini bar? Or a have a film lover’s theme and have framed classic movie posters like Pulp Fiction, King Kong, and The Shining? Your man cave can be a scuba-diver’s or hunter’s personal haven by putting in an aquarium and have your walls mounted with your trophies. In the end, what’s going to be most important is that the man cave you set up for yourself is something you can truly call your own. Take some time to reflect on what type of theme you really want for your room and go with it. Remember, your man cave should be a reflection of who you are. There’s no reason you can’t have that.